Last regime-held city taken by rebels in just a few hours as troops turn tail and run; Assad regime's manpower critically low. Syrian troops retreated as regime warplanes bombarded Al Qaeda-led rebel fighters on Friday, a day after the insurgents overran the last government-held city in the key northwestern province of Idlib. 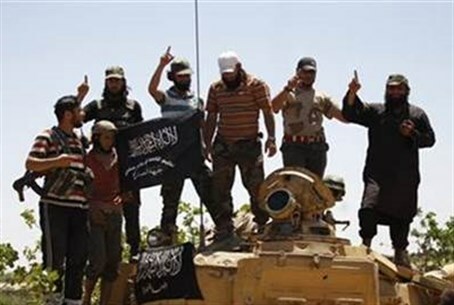 Opposition forces now control the vast majority of Idlib after Al-Nusra Front and its allies in the Army of Conquest captured Ariha and surrounding villages on Thursday in a swift assault. It was the latest blow to loyalist forces who have been battling myriad groups of rebels for four years, after the fall of the ancient city of Palmyra to the Islamic State (IS or ISIS) extremist group last week. "The lightning offensive ended with a heavy pullout of regime forces and their allies Hezbollah from the western side of the city," said Rami Abdel Rahman, head of the Syrian Observatory for Human Rights. The Army of Conquest - Jaish al-Fatah in Arabic - had also seized villages around Ariha as regime warplanes bombarded the city. The rebel alliance has won a string of victories in Idlib, including the provincial capital, the key town of Jisr al-Shughur, and a massive military base. Government forces had retreated from these areas to Ariha, which Abdel Rahman said was heavily defended by fighters from Iran and the Lebanese Shia Islamist terror group Hezbollah. But the city fell to the Al-Nusra-led alliance "in a few hours," he said. "The territories that are vital to protect for the regime are Damascus, Homs, Hama, and the coast," a Syrian security source said. "Idlib is no longer part of these calculations, which explains the army's rapid retreat," he told AFP. President Bashar al-Assad's regime still holds the Abu Duhur military airport and a sprinkling of villages and military posts in Idlib. The province borders Turkey to the north, coastal regime bastions to the west, and the flashpoint province of Aleppo to the east. Abdel Rahman said the regime was suffering from a serious lack of fighting forces and "could no longer afford any more human losses". "If this continues, the regime might lose Aleppo." Meanwhile in neighboring Iraq, government and allied paramilitary forces pressed an operation aimed at severing supply lines of the Islamic State group in the western province of Anbar. Clashes with ISIS in nearby Salaheddin left nine dead among the security forces and Hashed al-Shaabi, an umbrella for Iranian-backed Shia Islamist militia and volunteers, an army lieutenant colonel and a source at Dujail hospital said on Thursday. Anti-ISIS forces continued to close in on Ramadi, the capital of Anbar which jihadists captured on May 17, but no offensive to wrest back the city itself had begun. Prime Minister Haider al-Abadi said in a recent BBC interview that ISIS had been using fleets of huge truck bombs packed with several tonnes of explosives, making it difficult for his troops to enter the city. Also on Friday, Iraqi officials said at least nine people were killed and dozens wounded when bombs ripped through two upscale Baghdad hotels. The explosions, which struck the Ishtar and Babylon hotels, were heard across the city center just before midnight (2100 GMT) on Thursday. Iraq's health minister said the country's authorities have exhumed the remains of 470 people believed to have been executed by ISIS near Tikrit last year in what became known as the Speicher massacre. "We have exhumed the bodies of 470 Speicher martyrs from burial sites in Tikrit," Adila Hammoud told reporters in Baghdad. In June 2014, armed men belonging or allied to IS abducted hundreds of young, mostly Shiite recruits from Speicher military base, just outside the city of Tikrit. They were lined up in several locations and executed one by one, as shown in pictures and footage later released by IS on the Internet. The highest estimate for the number of people killed in one of the worst ISIS atrocities stands at 1,700. The exhumed remains came from four burial sites, including one which contained 400 bodies, said Ziad Ali Abbas, the chief doctor at Baghdad's main morgue. "There were several layers of bodies all piled on top of each other," he said. The Speicher massacre played a key role in the mass recruitment of Shia volunteers to fight the Sunni Muslim jihadists.